The third and final part of my series on the state of the publishing industry is up now at Critical Margins. Go check it out! Or start here with Part One! I'm proud to be able to send you over to Critical Margins today, where owner Kevin Eagan has been kind enough to follow through with the publication of the second part of my three-part essay on the "Current and Future States of the Publishing Industry," specifically regarding "Advertising, Promoting, & Marketing a Book." I look forward to hearing your feedback and questions! Buy the book at Smashwords, Amazon, or Barnes & Noble! 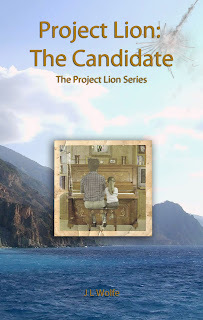 I'm proud to announce the release of the first book in the Project Lion Series: The Candidate, by JL Wolfe. This book was a blast to edit, with witty dialogue and exciting action scenes. Please check it out, and leave some feedback! I'm looking forward to seeing (and hopefully editing!) the second book as soon as it's finished. Loved it, hope you do, too. Here's the author's own description: Driven on by a need to locate and secure his wife and children, Alex Martell finds himself thoroughly unprepared as he becomes swept up in global conspiracies and the agendas of competing world powers. Selected and known as the Candidate, he is thrust back in time to the dawn of Western civilization in order to bear witness to a list of historical events. With time working against him as the Intersection Point closes in and determined to salvage his cherished, simple, safe, and sheltered family life, he must weave through history unnoticed and avoid losing himself in the process. Pick it up at Smashwords, Amazon, or Barnes & Noble. 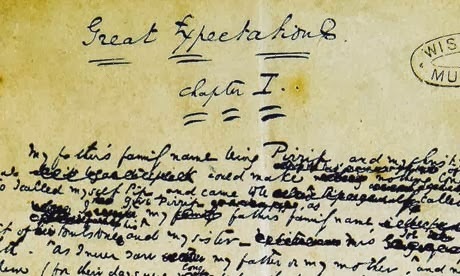 I really enjoyed this post from Alison Flood at The Guardian about Dickens' original, handwritten draft of Great Expectations. I think it provides a prime example of how authors can focus on getting the story out first and worry about the finer details later. Great Expectations, of course, is an oft-taught classic by one of the most highly esteemed English authors who's ever lived. Seeing the sloppy writing crash into the margins, spelling out many sentences that didn't make it into the final draft is key evidence that great writing is the product of great editing. 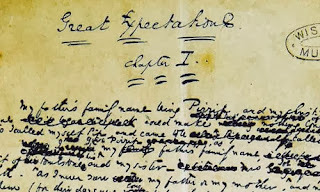 Photo of Great Expectations manuscript courtesy of Cambridge University Press. Publishing is a marathon. It's a long way from start to finish. Great writers, like great runners, know the race is won through pacing, stamina, and support, not just a big, long burst of speed. Many books are begun with an epiphanic explosion of inspiration in which the writer leaps from a standstill into a dozen-page-at-a-time writing trance. Some people finish books still in this trance, but most never make it into the third chapter. The thing about publishing, though, is that it encompasses so much more than just writing. It requires revisions and editing, soliciting, a platform, marketing, distribution, formatting, and a plethora of other tasks depending on the publication in question. Losing steam in those later, tedious stages can result in just as much of a failure as giving up fresh out of the gate: crossing the finish line is the only goal that counts.